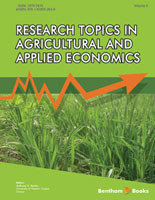 This volume of “Research Topics in Agricultural and Applied Economics,” edited by Professor Anthony Rezitis, maintains the standards set in the previous two volumes by presenting 9 papers which report high quality applied economic research. Several of the papers adopt modern empirical approaches, such as neuro-fuzzy techniques, stochastic DEA, and choice experiments, while others are based on recent theoretical developments in the areas of new institutional economics, transaction cost economics, information and contract design. Most of the applications focus on the agricultural sector. These include ‘traditional’ topics, including the study of sector efficiency, the Common Agricultural Policy, and the agri-food chain, as well as the analysis of agri-environmental issues, such as waste disposal, the role of energy crops, and the governance of agro-ecosystem services. The volume concludes with two papers with a broader application, namely carbon offset projects and transportation infrastructure. Readers should find much of value here, whether their interests lie in economic theory, applied techniques, policy issues or the details of the specific applications presented. The volume, together with its two predecessors, offers a very worthwhile contribution to the literature. entitled “Milk production forecasting by a neuro-fuzzy model”, uses a hybrid intelligent system called ANFIS (Adaptive Neuro Fuzzy Inference System) for predicting milk production. The results indicate the superiority of the ANFIS model when compared with the two conventional models: an Autoregressive (AR) and an Autoregressive Moving Average model (ARMA). entitled “The role of production contracts in the co-ordination of agri-food chain: evidence and future issues for the durum wheat chain in Italy”, explores the role of production contracts in the co-ordination of the agri-food chain, taking into account evidence from the particular case of the durum wheat chain in Italy. entitled “Effects of the European Union Farm Credit Programs on Efficiency and Productivity of the Greek Agricultural Sector: A Stochastic DEA Application”, examines technical efficiency and productivity growth of Greek farms participating in the 1994 European Union Farm Credit Programs using the approach developed by Simar and Wilson to bootstrapping both DEA efficiency measures and Malmquist productivity indices. entitled “Institutional Innovations in the Common Agricultural Policy: A Theoretical Approach based on Legitimacy”, analyzes the role of different exogenous and endogenous factors which have been boosted or slowed down by CAP reforms. The main results show that the EU institutional structure is a fundamental factor. entitled “Agricultural Externalities and Environmental Regulation: The Case of Manure Management and Spreading Land Allocation”, describes how the measures are introduced by the European regulation on manure management are incorporated into the theoretical analysis framework for studying the issue of nonpoint externality especially, agricultural runoff. entitled “Energy Crops Situation in Castile and Leon: Incentives and Barriers to Success”, examines the current situation and the possibilities of development energy crops by Castile and Leon farmers using the Rural Rapid Appraisal (RRA) and Strengths, Weaknesses, Opportunities, Threats (SWOT) methods. entitled “Governing of Agro-Ecosystem Services in Bulgaria”, incorporates interdisciplinary New Institutional and Transaction Costs Economics and analyzes the governance of agro-ecosystem services in Bulgaria. entitled “Ex Post Liability for Loss vs. Ex Ante Liability Insurance as Solutions to Reversal Risk in Carbon Offset Projects”, examines how ex-post liability rules and ex ante liability insurance requirements can affect the nature of contractual agreement between an investor and a host, and the induced level of effort under asymmetric information. entitled “A Choice Experiments Application in Transport Infrastructure: A Case Study on Travel Time Savings, Accidents and Pollution Reduction”, presents the results of a Choice Experiment aiming to value different characteristics relating to the construction of a public highway in Greece.